This mansion home was designed by distinguished architect John Beswicke for the house on the corner of Auburn Road and Harcourt Street Hawthorn in 1899. 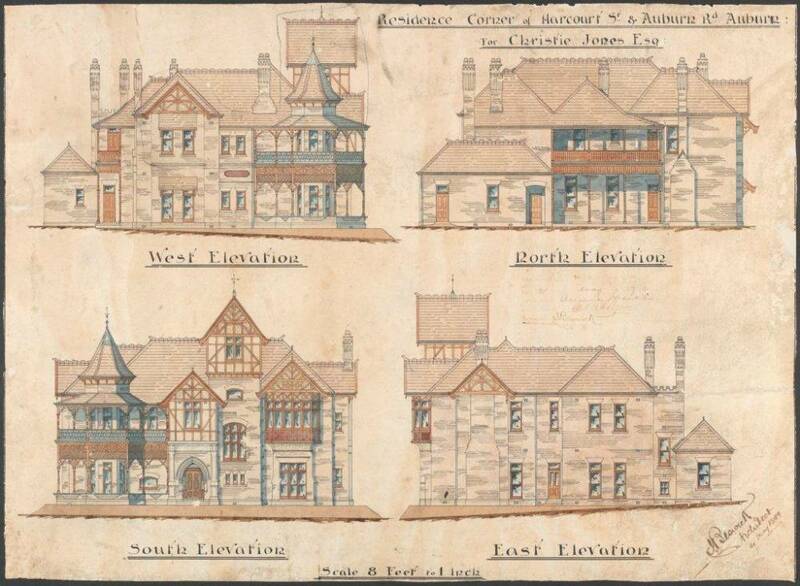 Beswicke designed many notable buildings including the Hawthorn Town Hall, the 3-storeyed shops in Auburn and perhaps 14 homes in Harcourt Street. 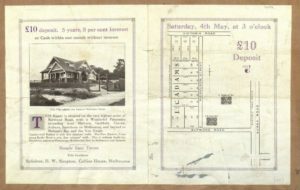 Apparently planned as Beswicke’s family home, the family remained at “Rotha” and it was occupied by Christie Jones, then the Warburton family in 1905. From the 1940s to the 1980s it was occupied by a Salvation Army hostel. In 1917 Fred Nicholson owned land nearby. The area had been fashionable since the early 1850s, with ‘Tara” of Sir John O’Shanassy across Burke Road, and nearer properties on the hill of Edward Tyson and Daniel Bedggood. This Plan of subdivision for the sale of 11 allotments took place in 1918. The terms of sale are interesting with 10 Pounds deposit and “easy terms “of 5 years for the residue at an interest rate of 5%. Lots on the eastern side of the new Nicholson Street were subdivided and sold in 1924 at the higher price of 10 pounds per foot of frontage (inflation in 1924). In The corner homes of Cr John Chalmers and Charles Carter were built by 1919, and the first homes behind in 1924. It is worth a look, because most of the houses from that era remain. 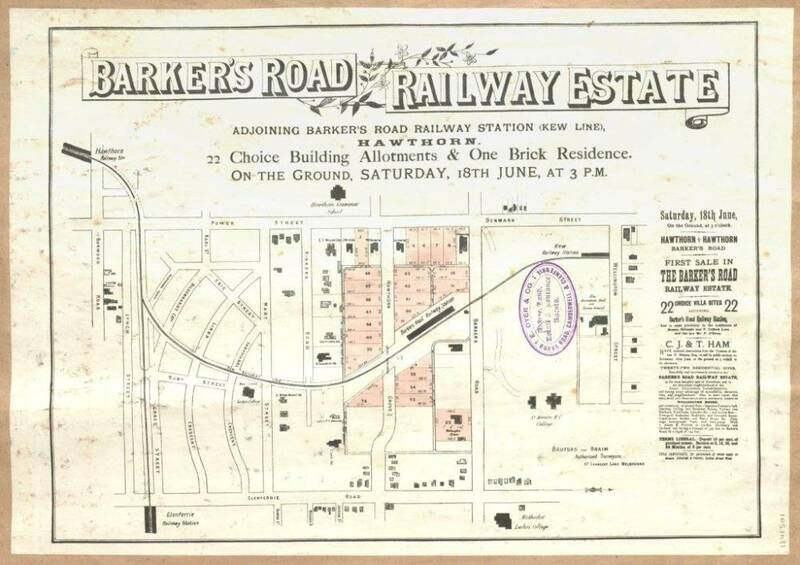 The plan shows the railway that once curved from Hawthorn Station to Kew through the Grace Park and Kinkora Estates. Crown allotments 35 and 36 were originally purchased by John McAley but by 1853 most belonged to Daniel Meaney and Thomas Johnson’s Rose Nursery near the creek and Glenferrie Road. 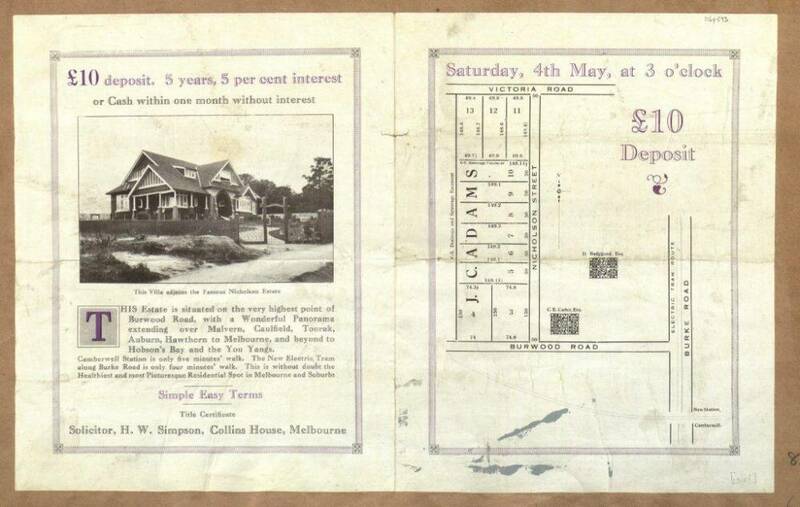 Meaney’s Boroondara Family Hotel was built in 1855 and football was played on his paddocks behind. The estate was for sale by trustee Thomas Kelly in 1881 but delayed by the railway. 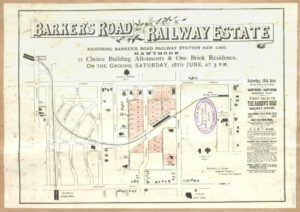 The railway closed in August 1959 and the Barker Station, built in 1887, was replaced by the Californian Motel in 1959. Years later it was remodelled for student accommodation, then remained in a sorry state for many years until it was demolished in 2013 awaiting re-development. 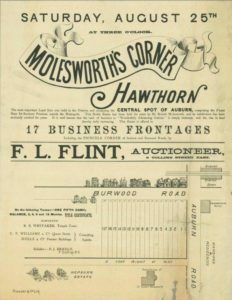 Plan and brochure offering for Auction the northern portion of Sir Robert Molesworth’s property ‘Edlington’ 25/8/1888. It was believed that the new railway station at Auburn would create a major shopping centre. 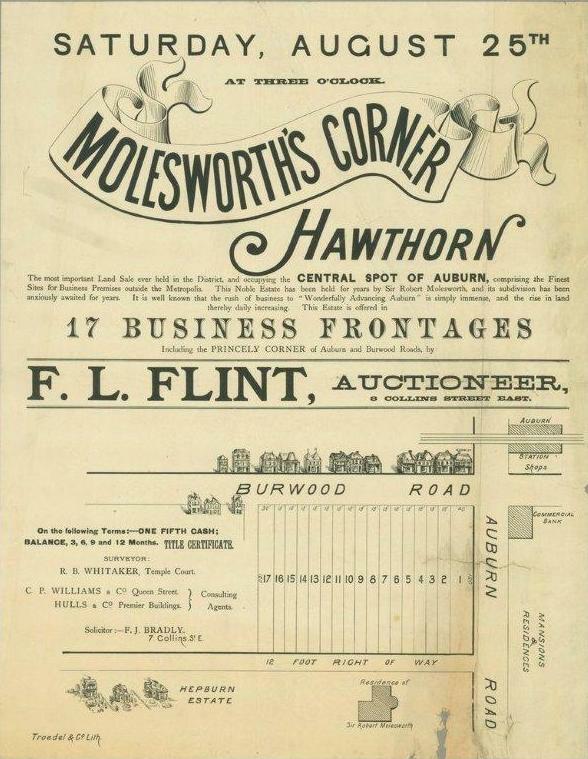 Molesworth Corner was advertised as “the finest sites for business premises outside the metropolis” in 1888. At the auction, in front of apparently 2000 people they achieved the highest price of the boom years, at 180 Pounds per foot of frontage. Estate agent Frederick Flint was presented with a gold hammer to conduct the sale, with corner block sold to Mayor George Grant Munro for the grand total of £7,000+. But with the crash of the 1890s the actual corner remained empty, with only the terrace shops at 574-584 Burwood Road built nearby with other buildings slowly developed into the 20th century. 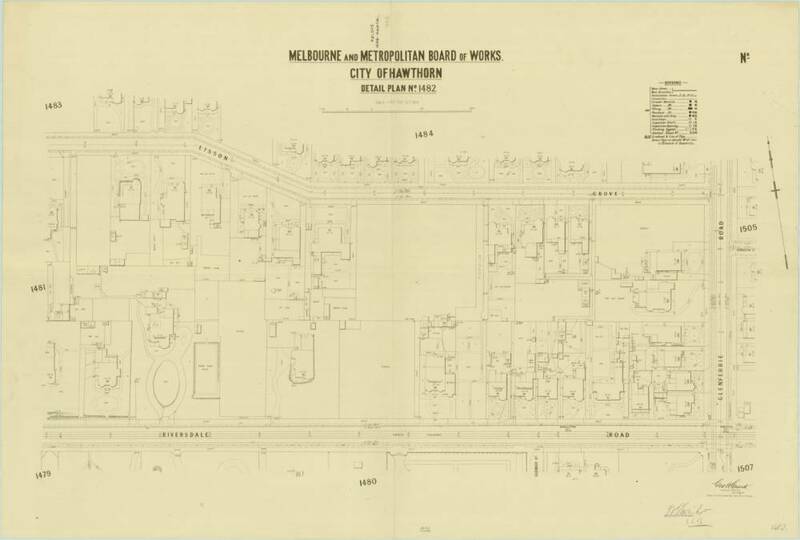 This Melbourne Metropolitan Board of Works plan is typical of those prepared to assist the reticulation of sewerage in Melbourne around the turn of nineteenth century, and in Hawthorn, starting by the river in 1900. They are invaluable for local history research as they show the footprint of each house, property features, front verandahs, gardens, out-buildings, drives, water courses, brick pits, dips and lanes. Buildings were crossed with lines – straight if timber, angled if brick. 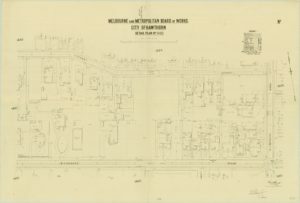 This plan shows the area immediately to the north of the Riversdale/Glenferrie intersection encompassing the east end of Lisson Grove. There were a number of high quality houses (often named and sometimes mispelt Lyndale/Lymdale) with large allotments featuring tennis courts, orchards and numerous outbuildings.